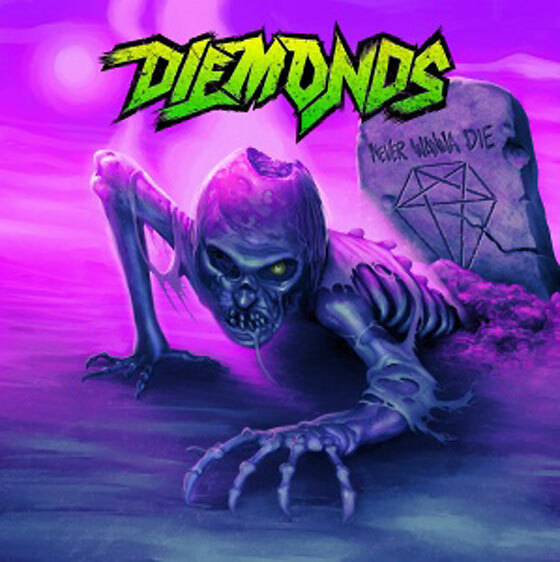 Sunset Strip-influenced hard rock outfit Diemonds have revealed that they have a shiny new album on the way. The band will issue their sophomore full-length, Never Wanna Die, August 14 via eOne Music/Underground Operations. A press release confirms that the record will be the band's first with eOne, and that it was tracked with producer Eric Ratz (Monster Truck, Billy Talent). Though the band had previously issued the In the Rough EP in 2011 and debut full-length The Bad Pack in 2012, this marks the first time the band had worked with an outside producer. "Working with Eric Ratz was a rad experience for us," guitarist C.C. Diemond said in a statement. "We've never had the chance to work with a producer and he definitely helped us find the best way to showcase our new songs. We've come a long way since the last record, so we can't wait to get this album out there!" Previews from the set have yet to be delivered, but the record is said to have vocalist Priya Panda still walking the "fine line between class and crass" as she "breaks every cultural, social, gender and sexual boundary known to hard rock." Song titles include "Hell Is Full," "Ain't That Kinda Girl" and "Forever Untamed." You'll find a full tracklisting for Never Wanna Die down below, and the appropriately grave-escaping cover art up above. Diemonds will show off the new album at Toronto's Canadian Music Week on May 8 at the Hideout.